The Good, The Bad and The Ugly Marathon. Betteshanger Country park, Deal, Kent. It was an early start on a chilly winter's morning in the car, myself and my girlfriend were making our way through deserted roads down to the Betteshanger Country Park in Deal, Kent, for my next challenge, marathon number 6. The wind was already blowing a gale but thankfully it wasn't raining and I had a really good feeling about the race ahead of me, little did I know that the English coastal weather had it in for me, again! I no longer felt nervous or anxious at these events, they are always superbly organised by Traviss Willcox and Rachel Smith. The Saxons, Vikings and Normans (SVN) Marathons and timed challenges have become a firm favourite with me and so I smiled and greeted the friendly faces of fellow runners around me at the extremely chilled out head quarters. I collected my number and 13 hair bands, this is lap counting technology at its finest! I was ready to take on marathon number 6 of my 50 before 50 challenge. The route consisted of one loop of 2.02 miles around the cycle track of the country park, all on Tarmac, repeated 13 times, each lap you gave a hair band back in and on the last lap you got to carry a St George's flag. But, wait I'm getting ahead of myself talking about the last lap and flags! Rewind! The SVN crew had set up their infamous aid/cake station halfway around the course and you could smell the goodies from the start line. My other half Caz had cleverly located herself there too, out of the wind and near cakey goodness!! A friendly face had spotted me, a Facebook running buddy called Tracy who was lined up for her first marathon and feeling rather nervous. We had a good catch up and realised our pace/time would be similar, so decided to start the run together and see how it panned out. We both eagerly awaited the off, feeling excited and a bit giddy. Tracy and I chatted away happily for the first few laps as we tried to ignore the increasing wind on the last half mile of each loop, but by lap 6 the howling wind was so strong it stopped us in our tracks! We both gave up running and walked for 10 mins until we turned back out of the wind and were on the home straight. The mental toughness I had started with was dwindling fast and I started to lose motivation by lap 7-8 but just as I began to unravel the best little support crew turned up! 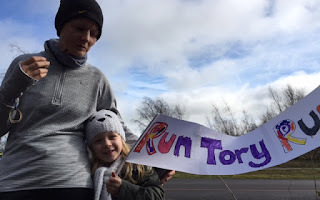 One of my best friends Ronnie and her daughter appeared just in the nick of time, Abby was full of smiles and had made a huge banner with the words “Run Tory Run” on it, making me feel like an athlete competing for my country and not just a recreational runner. my number 1 fan, Abby. I stopped for hugs and ate some homemade fudge with Cadbury’s Creme eggs crammed in it and decided to get my mojo back! Powered on by confectionery and my number 1 fan, I was even more determined to beat the windy conditions and finish in under 5 hours. There was no wall at mile 18, just a great big pile of self-inflicted pain! Everything had started to hurt and I just wanted to stop. My left knee and It-Band were uncomfortable, my right hip flexor ached and I was fairly sure that most of the toes on my right foot were either covered in blisters or had fallen off completely! I had made the rookie error of changing my tried and tested Asics socks for Cep calf compression sleeves and now I was paying for it! We were both still running and walking the same parts of the course but it hurt like hell and the winds were just getting tougher and stronger. We chucked our last hair band in the bucket and picked up a flag, sadly at this point Tracy and I parted company. I felt bad but I wanted to get the last lap done and I had just enough in my legs to blast around the track one more time. I switched off my brain and mentally slapped myself around the face a few times!! I chanted to myself “You can do this Vix, you can do this!” and so I did. I ran and I ran and I ran! I clutched the flag in my fist as if my life depended on it and as my tired little legs crossed the finish line, a huge smile took over my face and all the pain disappeared! The last lap was my 2nd fastest and I finished in 4.48, not my best time, but not my worst either and, considering the wind had added at least an extra 20 mins on, I wasn't too far off my pb. This was also nothing compared to the torturous Dymchurch (number 5) back in Nov! Tracy had also been spurred on by the supporters and made it back in under 5 hours, not far behind me. We were both elated and hugged each other. Myself and Tracy. Happy, but slightly wind swept. The medal was the best to date, depicting a scene from the film The Good, The Bad and The Ugly. Traviss and Rachel had also supplied the best God damned goodie bag in town, with everything that a post marathon runner could desire! Chocolate, crisps, cider and of course the ever sought after chocolate orange! As usual, my mental state was a mixture of euphoria and exhaustion and so, with legs of jelly I made my way to the cafe to sit down and have a rest. I ate some food and enjoyed a hot chocolate with Caz, Ronnie and my number 1 fan, Abby. Whilst contemplating the blister/loss of toes situation on my right foot, I drifted in and out of conversations and people watching. Friendly runners were comparing their races, talking about past experiences and revealing where their next marathon was going to be. I am still in awe of how many marathons my fellow runners have completed, 30, 112, 230, 800! Wow, these chats always encourage me as a beginner and motivate me to achieve more and even though my plan is to complete 50 full marathons before my 50th birthday (7 years to go), I get the sense from the 100 marathon club members that I could end up heading on my own quest towards 100 marathons! Am I really that crazy? Will my legs hold out? 100 before 50? Surely not! Hmmm that is food for thought, but for now I will concentrate on the 50 in hand! The medal was the size of an Ipad! Thank you for reading my blog, I will be tackling marathon number 7 in Paris on 3rd April and will update you on my progress on my return.